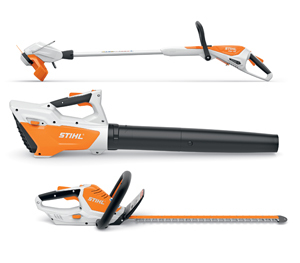 STIHL now has three new entry-level power tools for use in smaller gardens: the HSA 45 battery hedge trimmer, the FSA 45 battery grass trimmer and the BGA 45 battery blower. The machines combine the advantages of battery technology with excellent performance at an attractive price. The core of the three new models is an integral 18 V lithium ion battery, which can be charged via a separate charging cable and the status checked using a charge status indicator on the machine. Thanks to the built-in batteries, the machines are very light and manoeuvrable, as they do not require a battery compartment and the integral battery does not need a housing of its own. In addition, they provide lots of comfort details that are typically STIHL. They are perfectly balanced and have ergonomically optimized soft handles for easy, secure handling. And for best possible safety in storage, maintenance and transport they have an activation key that can be removed to switch off the power to the machine.